People are attracted to kiwifruit because of its brilliant green color and exotic taste. But, the real uniqueness of kiwi fruit comes from its health benefits. Read the kiwi’s fourteen health benefits, interesting facts, and how to use this amazing power food. Raw kiwi contains actinidain, a protein-dissolving enzyme that can help digest a meal. Kiwis low glycemic index and high fiber content means it will not create a strong insulin rush like other fruit with high sugar contents-so the body with not respond by storing fat. 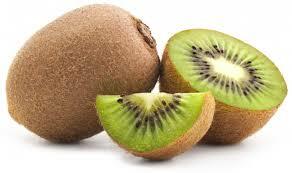 The fuzzy fibre of kiwi helps bind and move toxins from your intestinal tract. Macular degeneration is the leading cause of vision loss in older adults. A study on showed that eating 3 or more serving of fruit per day decreased macular degeneration by 36%. This is thought to be associated with the kiwi’s high levels of lutein and zeaxanthin — both of which are natural chemicals found in the human eye. Kiwi fruit is on the list of foods that are generally safe from a lot of pesticide residues. For 2012 it came in with the Top 10 safest foods .